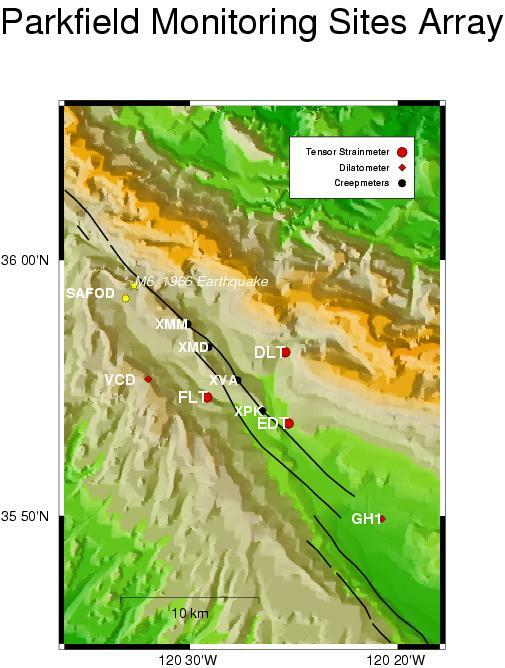 High precision and high stability measurements of the horizontal strain field in a region are made in California using the original GTSM systems. These instruments were installed at a depth of 100-200 metres at 7 sites in California. The sites are shown in red in the accompanying map. A calibration method that incorporates cross coupling of remote areal/shear strains into instrument areal/shear strains has brought strain tides measured by the Pinon Flat GTSM (borehole diameter 200mm) into very good agreement with strain tides independently measured by the co-located LSM (dimensions ~1km). 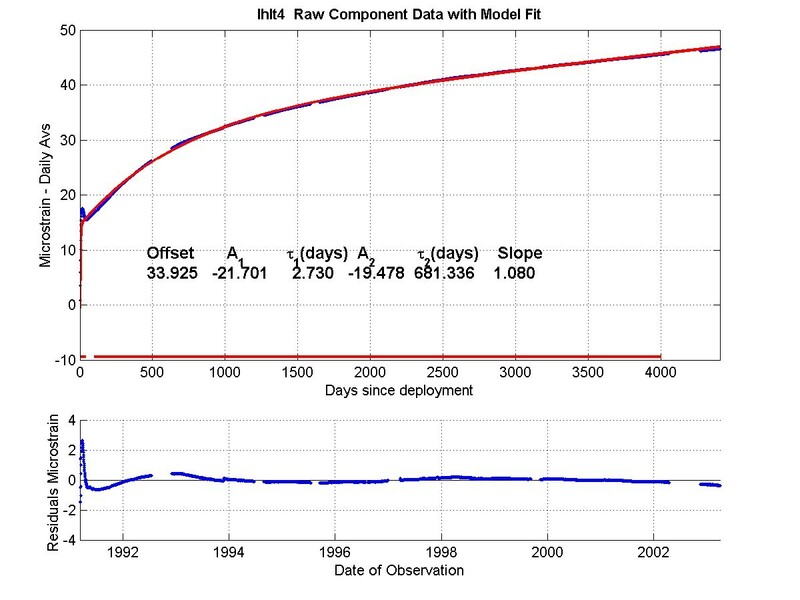 The cross coupled calibration has also yielded good agreement between the GTSM observations of the 1992 Landers earthquake and geodesy-based modeling, and co-located EDM measurements (Hart, Gladwin, Gwyther, Agnew and Wyatt 1996). This paper is reproduced with kind permission of JGR. Though the short baseline GTSM instrument shows higher short period noise than the LSM, the simplicity, low maintenance and relatively low cost of the GTSM system is a major differentiating characteristic. NEHRP GTSM instruments consist of a three component plane strain module operating at strain sensitivity of 10-10 and include a data logging system. As deployed in the NEHRP project, they provide data sampling at 30 minute intervals for transmission via satellite to permanent archive. 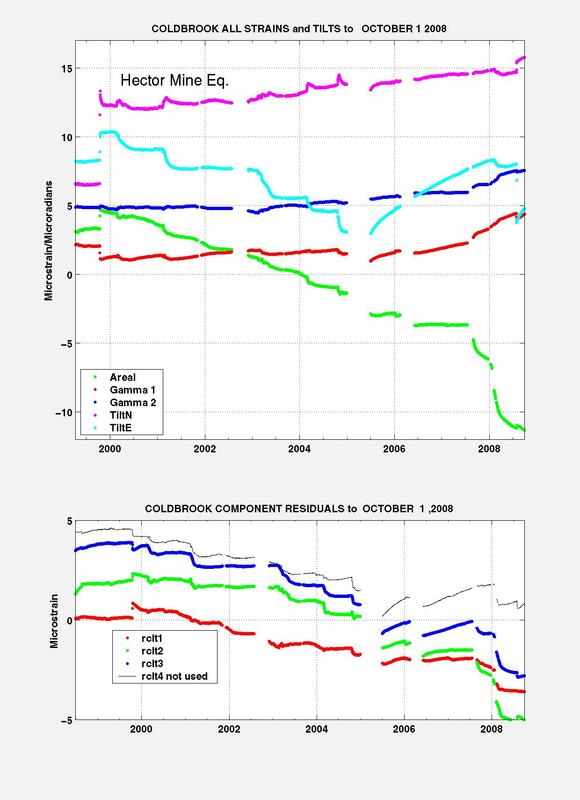 The instruments are unique in the NEHRP program in that they have provided continuous tensor strain data for the past twenty years at a sensitivity not achievable by any other instrumentation. 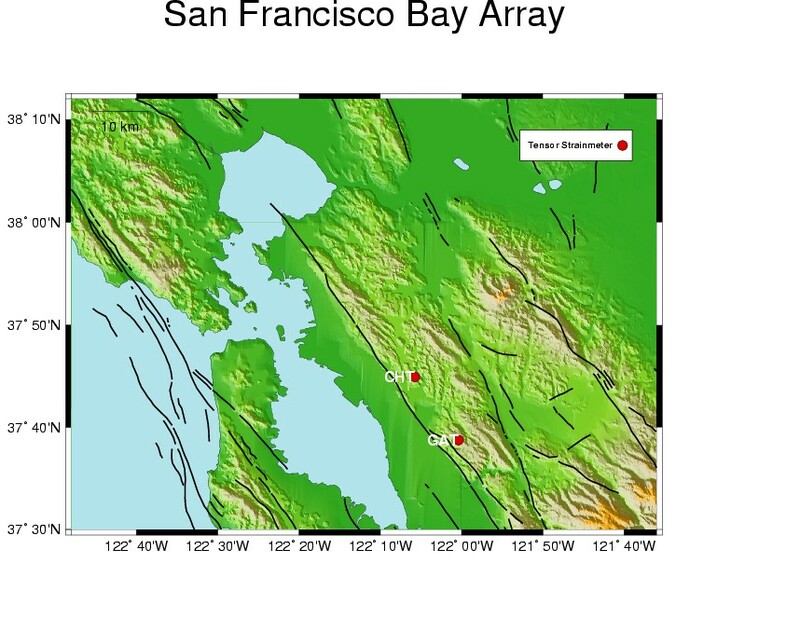 Data are also made available in near real time in the USGS Menlo Park computer system. 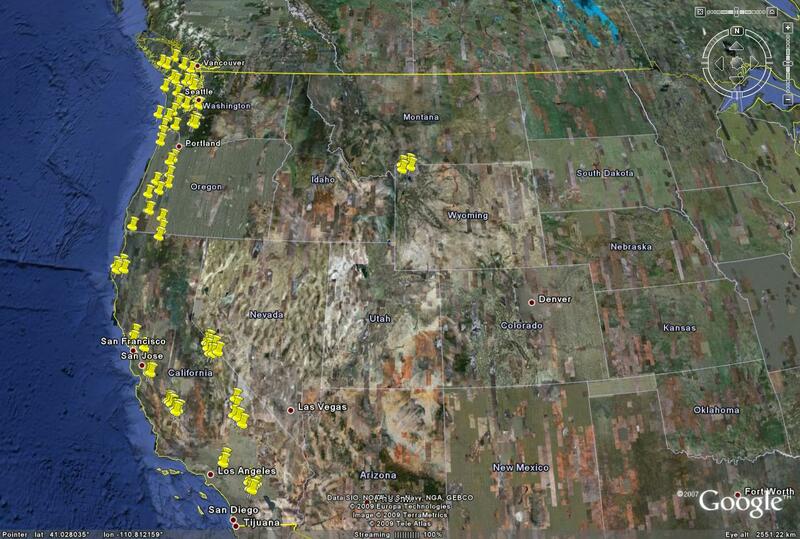 In 2010, GTSM Technologies transferred management of these systems to USGS scientists. Residual data are recovered from the raw data by extracting least squares fitted exponential(s) and a linear function which describe the processes of curing of the grout and recovery of the borehole caused by the drilling and installation disturbance of the virgin stress field. 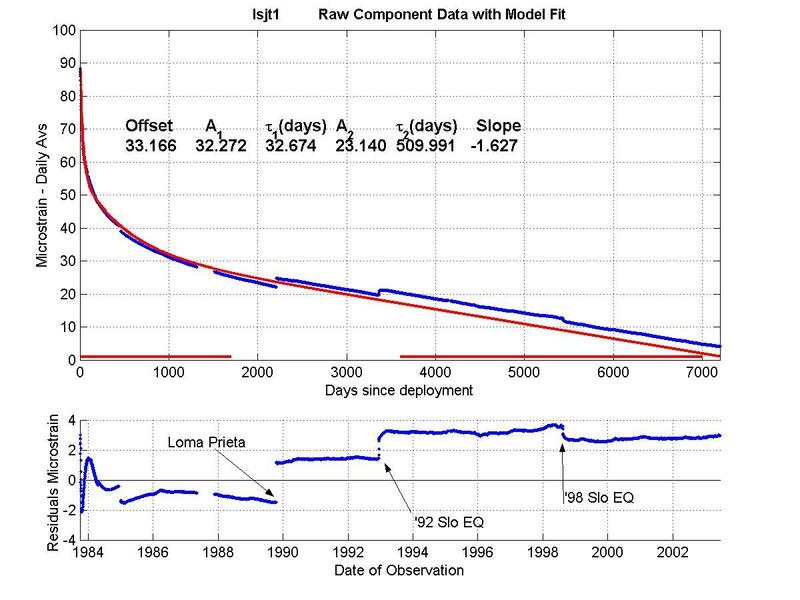 In August 2003, the borehole recovery exponentials were updated from values determined in the early 1990's to incorporate the additional 10 years of data length then available. 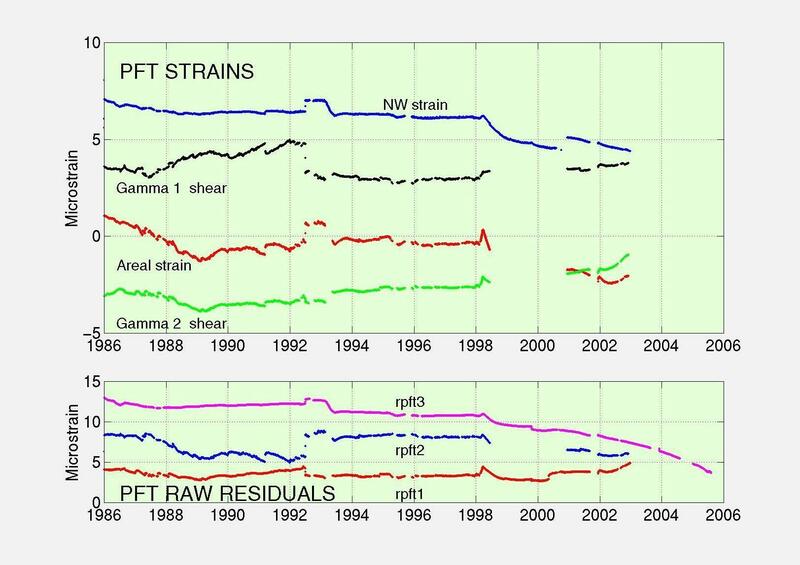 Changes of strain rates calculated from these residuals are unaffected by the exponential removal procedure and allow the very long term stability of the instruments to be quantified. 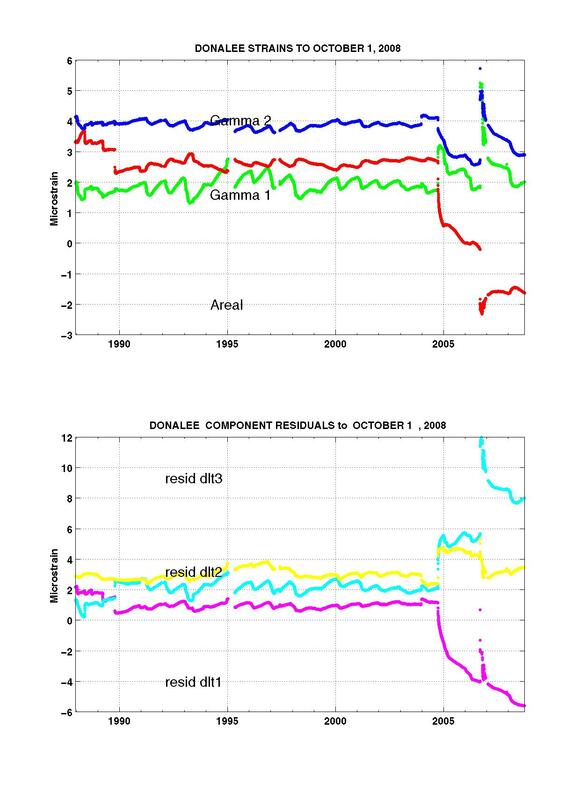 For non-tectonic sites as we have in Australia, instrument stability is easily demonstrated. · CHT and GAT are situated in the East Bay region of San Francisco Bay. 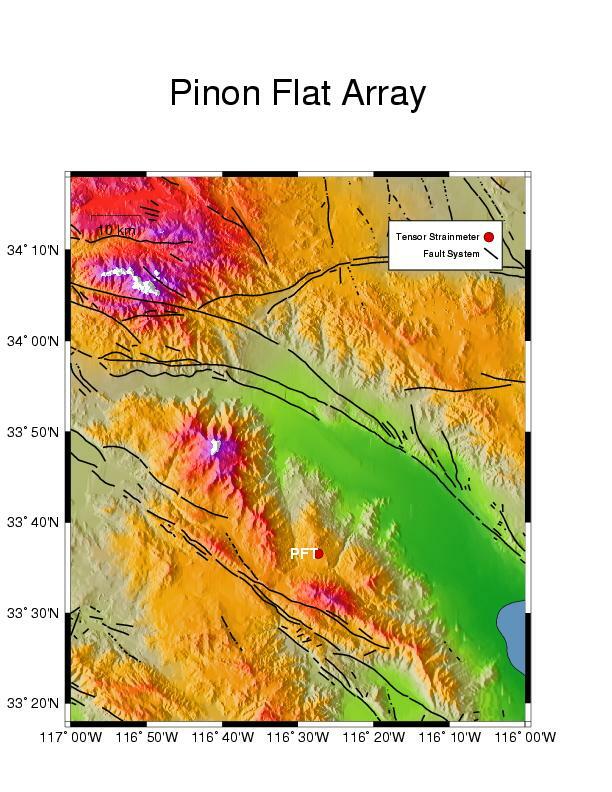 · PFT instrument is situated in Southern California, in the mountains near Palm Desert. · Long term strain accumulation. 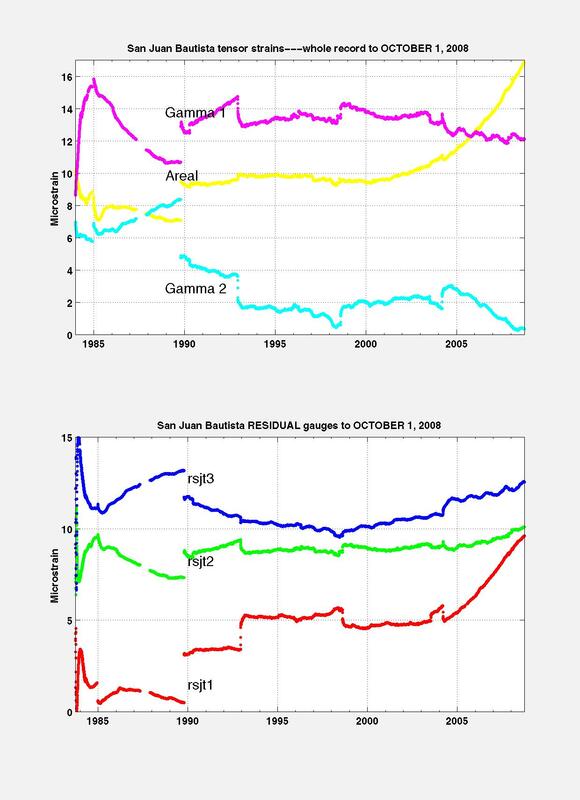 Data records are available from SJT and PFT from 1984, and from the three Parkfield sites EDT, FLT and DLT from 1987, and from the East Bay sites GAT and CHT and from 1993, and the most recently installed station CLT near Los Angeles from late 1996. 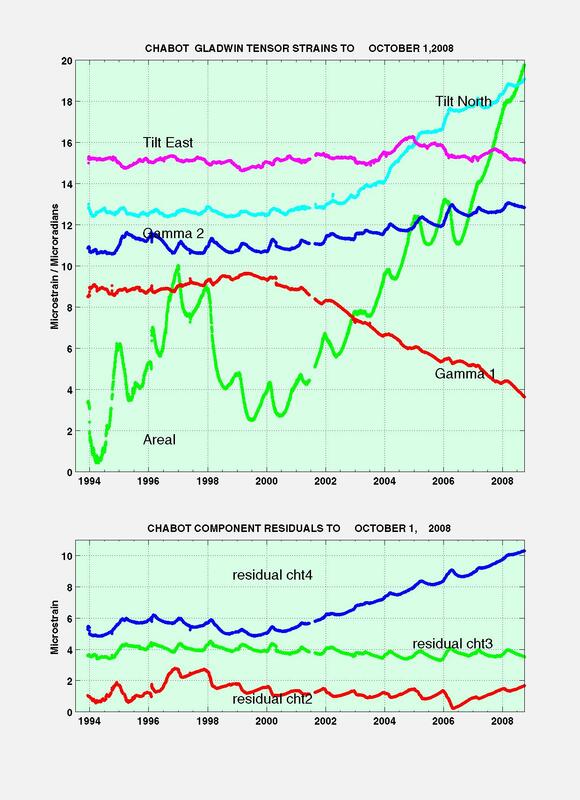 Borehole tilt measurements at GAT and at CHT are also available since 1993 and at CLT near Los Angeles since early 1997. 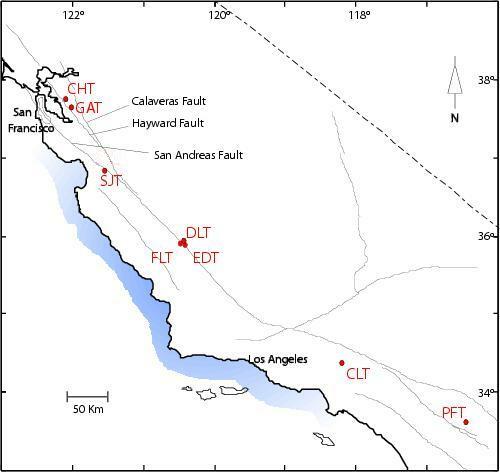 · Medium term strain changes associated with earthquake activity and other fault processes. 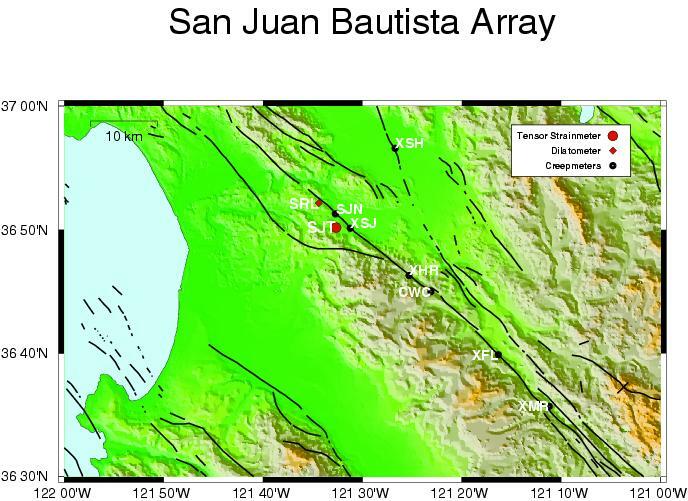 The sample data shows a slow earthquake sequence recorded at SJT in 1992. · Coseismic strain offsets useful for constraining earthquake source mechanisms. 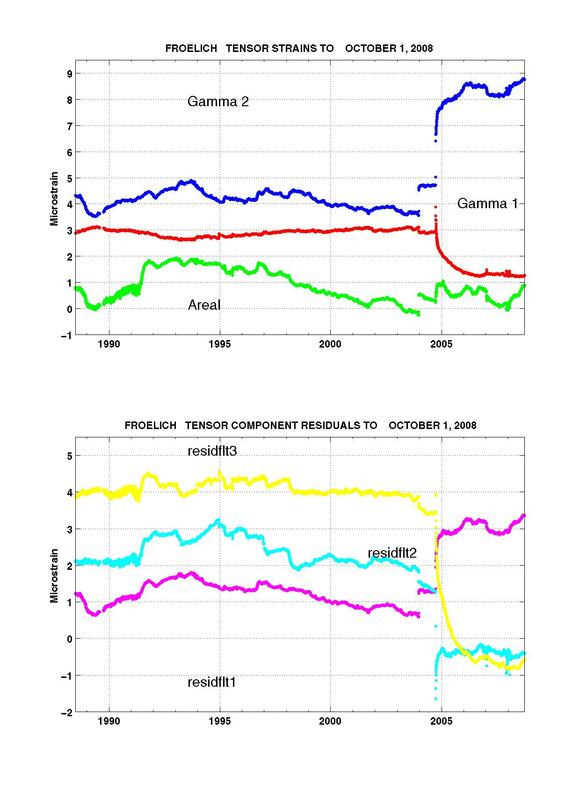 The sample data shows coseismic strain offsets observed at PFT during the 1992 Landers and Big Bear earthquake sequence (100 km from PFT).